A mad scientist wants to create a race of super gill men, so he uses the glands of wrestlers because they are "perfect". 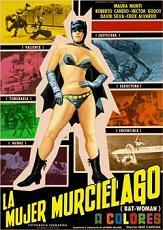 Then, wrestlers are turning up dead all over Acapulco, so the call goes out for that mysterious crime fighter Batwoman! (Maura Monti) She has the Batman cape, cowl and boots--only Batman doesn't wear a bikini. The doctor succeeds in creating a gill man and then Batwoman tosses acid in the scientist's face. So now he wants revenge and wants to turn her into a gill woman. Will he accomplish the dastardly deed? Tune in tomorrow! Same bat time, same bat channel! (In Spanish language).